Description: For Sale is a fresh professionally built 12-bolt posi rear. Housing is originally from a late 60's GTO or Olds 442. It's been shortened, straightened plus beefed with additional re-enforcing welds and made to fit all the first gen. Camaros, F/B's and '68 through 70's SS Novas. Gears are brand new Richmond 3:90's able to handle those big brute 450 HP engines! Plus new drum or disc brake set-ups available. 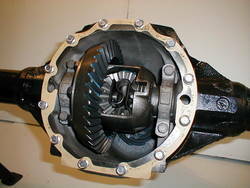 Every pro-built differential is guaranteed against any noise or leaks. At Street-Wise Performance your satisfaction is very important, so please email or call (973)786-7500 with any questions or special requirement needs. Easy pay terms with Visa/MC/Disc/Paypal, plus back to offering installment lay-a-ways. And please include a $75.- wood crating charge for truck shipments. (39 yrs. stock/performance building) Richie in NJ...Street-Wise Performance.